Feb. 1, 2008: After two years of talks and speculation, Microsoft makes unsolicited offer to buy Yahoo for $31 per share, or $44.6 billion. Feb 3: Google Inc.’s top lawyer says the buyout could hurt Web innovation. Feb. 4: Yahoo CEO Jerry Yang tells employees that selling to Microsoft is an option. Feb. 11: Yahoo rejects Microsoft’s offer, saying it “substantially undervalues” the company’s brand and worldwide assets. Feb. 19: Microsoft Chairman Bill Gates tells The Associated Press the software maker isn’t in talks with Yahoo about raising its offer. Yahoo releases details of severance plans that would take effect after a buyout, which could make the deal more expensive for Microsoft. March 5: Yahoo extends a deadline for nominating candidates to its board, buying time to strike an alternative deal. 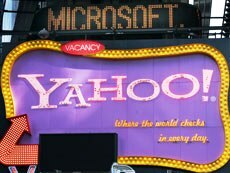 Yahoo is said to be in talks with Google Inc., News Corp.’s MySpace.com and Time Warner Inc.’s AOL. March 10: Senior executives meet near Yahoo’s Sunnyvale, Calif., headquarters. March 18: Yahoo releases optimistic revenue forecast for next two years to justify rejecting bid. April 5: Microsoft CEO Steve Ballmer gives Yahoo three weeks to agree on a buyout or expect the software maker to go hostile — and potentially lower the offer price. April 9: Yahoo says it will try using Google’s search ad engine instead of its own in a limited test. Microsoft’s general counsel, Brad Smith, raises antitrust concerns. April 26: Microsoft deadline for Yahoo to accept the offer expires. Both companies remain silent. May 1: Ballmer tells Microsoft employees that he “won’t go a dime above” what he thinks Yahoo is worth, and that he is willing to walk away from the deal. May 3: Microsoft raises its bid to $33 per share, but Yang says the board won’t accept less than $37. Microsoft withdraws its offer. Hah! F****** Yahoo getting what they deserve.